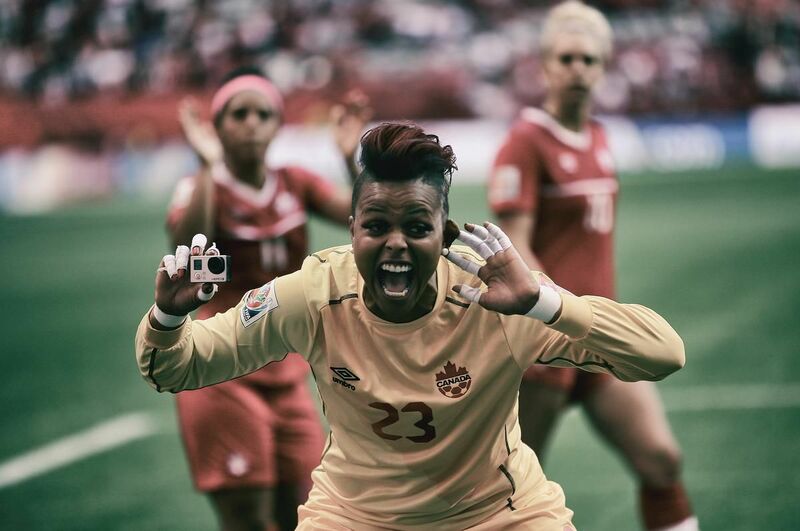 Former Canadian women’s national team goalkeeper Karina LeBlanc laughs when asked how it is that she retired from professional soccer three years ago but seems more involved in the game than ever. “It’s been crazy,” she said. “It’s been about reinventing who I am. I knew myself as Karina LeBlanc the soccer player, but what came after that?” She’s been LeBlanc the philanthropist, a UNICEF ambassador and founder of the Karina LeBlanc Foundation for adolescent girls who need support to achieve their dreams. LeBlanc the broadcaster, the motivational speaker and the Canadian ambassador for the United 2026 bid for the men’s World Cup, which paid off in Moscow last month. Most recently, she was LeBlanc the soccer fan, catching many World Cup matches in person. “Not two days were the same because I was just driven by, ‘How has my life and story put me in a position to impact and use my voice for a reason?’ I think when I started to connect those few things together I was like, ‘OK, well I don’t know where it’s going to end up, but I’m not going to take a job or a position that doesn’t answer all of those questions,’” she said. “That’s when this opportunity came about.” LeBlanc, who moved to B.C. from Dominica at age 8 and played for the national team for 17 years, was announced as CONCACAF’s first head of women’s football on Wednesday, a role designed to lead efforts to expand the women’s game in the North and Central America and the Caribbean. “Soccer changed my life,” she said. “It was one of those things where I saw the power of the game in my own story and in myself, and then through UNICEF and other different things I saw how it changed so many other kids lives, boys and girls. That’s why I felt like this would be a beautiful next step and next chapter for me.” The Star caught up with LeBlanc over the phone from Vancouver, where she was packing up for a move to her new home base of Miami, to discuss her new position. From your perspective, what does your new role entail? I think we have a great opportunity here to develop, enhance the game of women’s soccer in our region and take it to a new level. I think one of the most important things is, I only know what I know. I know that there’s so many different member associations and I need to go in and understand where the game is (at) in their countries. We want to see more girls and more women in the sport, from refereeing to development to administration. There’s so many areas where we can create opportunities for women in the game and I think that’s what’s important. There’s so many different issues across the 41 countries (that make up CONCACAF). In North America, it’s a different problem in the women’s game than it is in some of the smaller Caribbean islands, some of the Central American islands have a different cultural dynamic than it does up here so it’s not just one issue across the board. In a release when your position was announced, you said that this is a pivotal time in women’s soccer. Why? I think it’s a pivotal time for women. Women’s soccer, the numbers are starting to increase. You see across the board. Mexico, for example, they now have a league and you saw over 55,000 people show up to a women’s club championship. If you look at the highlights, it’s unbelievable, the passion. I think there’s more opportunity now because people are starting to see the game grow and this is the perfect time. In some (parts) of the world, women’s soccer’s been around a long time, but in some (parts) of the world this is the just where times are changing … From my end, it’s to support the mission of advancing the women’s game in a sustainable way and a way that we can increase the participation and awareness all over. What do you see as Canada’s role in advancing the women’s game in this region? I think Canada and the (United States) have always been on top. They’ve been the example. They’ve been the one pushing the envelope, and when you keep raising that bar you allow space for the ones that are lower on the awareness of women’s football. You give more opportunities that way … I think Canada is so important in the development of women’s sports. The (Women’s World Cup in Canada in 2015) is proof of it. When you have these big events, the world starts to watch and it’s about building off of that momentum, continuing to grow the game, continuing to grow grassroots, continuing to put women and keep women in the game. I think that’s why we need to have opportunities for the girls to play at all levels. Have a pro league for the women. I think that’s very important. One of the next big events on the FIFA calendar is the Women’s World Cup next summer in France. Why should people watch? If they watched the World Cup this year with France, this is why I wanted France to win, because I knew that momentum would go into the Women’s World Cup next year. I think for me the World Cup has always been about bringing the world together and when it comes to the Women’s World Cup it’s going to be about bringing the world together, but it’s going to inspire more people than you know, and I’m not just talking about young girls and young boys. I’m talking about human beings. I think that’s what it does.